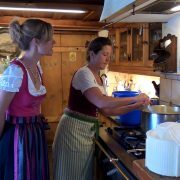 Having just came in from a beautiful early Sunday morning paddle around Schliersee lake and I thought I would share a tip with you all. Let me tell you that view of Brecherspitz from the water is something to be experienced first hand. 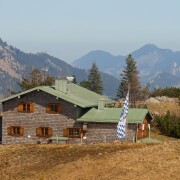 Located on the B307 just before you reach Fischhausen is a rustic building located just off two small parking areas. 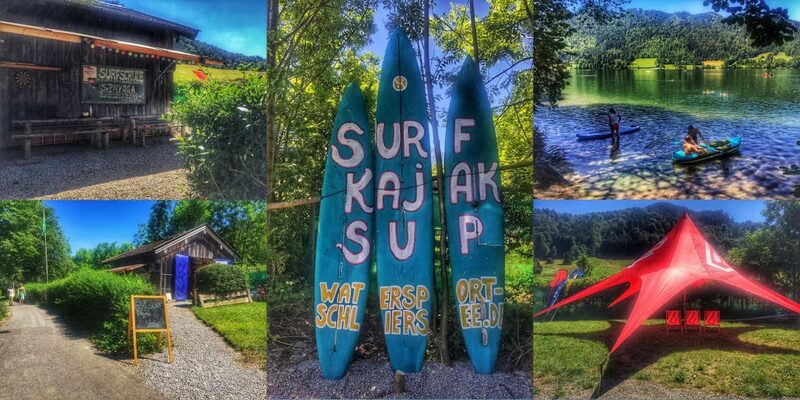 You will recognize it when coming from Schliersee by the three upright SUP creatively painted. 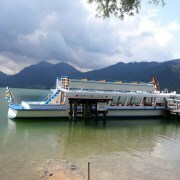 Watersport Schliersee has a well groomed small paddle sport ramp perfect for accessing the lake. You friends or family not interested in paddling will also find a nice rocky beach area, perfect for splashing and sun bathing while they wait. They do not offer any lessons but they have a vast array of Stand Up Paddle, kayaks and windsurfing rigs all for rental. I have also seen advertisement for SUP yoga so it would be good to ask Christoph the owner. He is very friendly and though they offer no courses they will give tips and hints on proper posture and any other questions you might have. Inside his lake side shop he has a good collection everything you need to get kitted out for a safe and fun day escaping summer’s heat. but also the soul. Get out on that lake. I look forward to seeing you out on water!